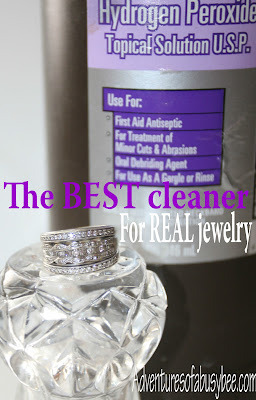 Adventures of a BusyBee: A sure-fire ring cleaner for REAL jewelry! Okay, I have to warn you right off the bat on this one. I am sharing a dirty little secret. It has to do with my wedding ring. My secret? My ring had gross stuff in it!! But, I did NOT know it. I'm so ashamed. Not really. It wasn't my fault. But I am sharing the dirty news because I was amazed at how much CRUD was hiding out in my wedding ring! Little gunks and goobies just nestling away in nooks and crannies. Ewww. The problems is that my ring has LOTS of holes and openings on the back side. See? The thing is, I get it cleaned professionally at least 2 times a month, and I clean it at home every 2-3 days. Plus I wear it in the shower and when I wash my hands. I always take it off when I'm putting on lotion or rubbing stuff into my hair. I THOUGHT it was pretty clean. The picture below is NOT pretty. I am telling you right now so you are not totally in shock when you see it. Please keep reading AFTER the picture so you can understand the reason for this post and learn what I learned in trying this technique! It's okay. I was too when I saw the results. 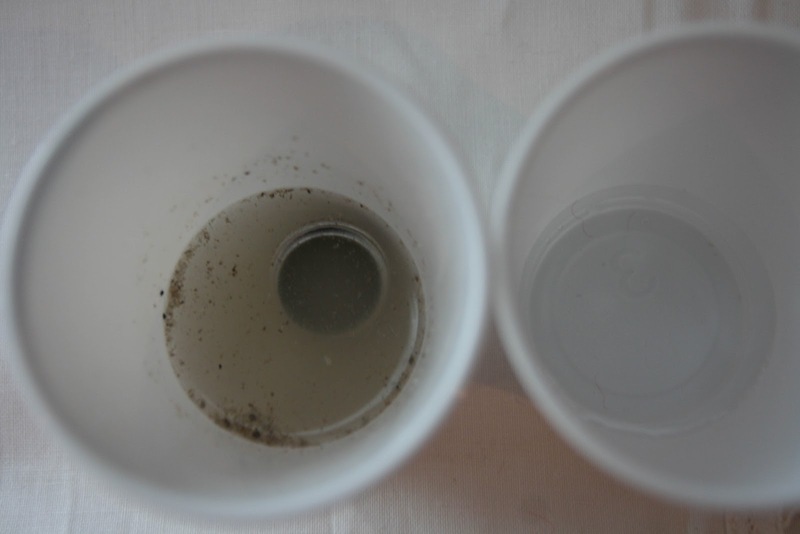 The cup on the left is after I had soaked, and shaken, my ring in straight hydrogen peroxide for 20 minutes. The cup on the right is plain HP. I did this 3 (THREE!) more times until I was able to get a completely clean ring with no floaties on the top of the HP. The next 2 times were almost as bad! The last time was mostly clean. The 5th time was totally clean. Now, keep in mind that the lighting creates a shadow that is not normally there, so the water looks dirtier in color than it really was. But, it was dirty, and those floaties were all there. I know. Freaking amazing, right? And gross. Anyway, the reason that I tried this little experiment is because of a conversation I heard at the lab the week before when I had to get some bloodwork done. One of the techs had grabbed a test tube vial and poured some Hydrogen Peroxide in it, dropped her ring in it, and started shaking the vial. The other tech asked her what in the world she was doing, and her response had me intrigued! "I'm cleaning my ring! It's the best way to do it. The bubbles in the peroxide go in and grab out all the proteins. They will float to the top and my ring gets cleaned!" So a couple of days later I poured some peroxide into an empty pill bottle and plopped my ring in. Gave it a shake, and walked away for 20 minutes. When I came back, I could not believe what was floating in there! 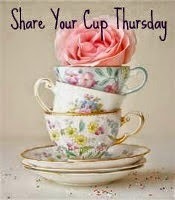 I poured it into the little dixie cups so that I could see it more clearly and show my husband. 1. Hydrogen peroxide is STRONG stuff. It will even remove blood stains, if you didn't know that already. Pay attention whenever you are using it!! 2. Do NOT do this on FAKE metal or costume jewelry. I'm certain it might kill it. Or something like that. I'd hate for you to ruin some pretty little thing you really like. 3. DO NOT do this on pearls...I am afraid that something bad will happen to them because you're not even supposed to use store-bought cleaner on them. So just don't do this with them. Please. 4. If you don't want to use the peroxide straight, then add some white vinegar to it. That will make it less potent. 4. Rinse your jewelry WELL in hot water afterwards. 5. I am not a jewelry professional. You may not sue me if you do this and ruin your jewelry. 'Nuff said. Next time I go to the lab, I am going to THANK that tech. She has changed my life. Since the initial "cleansing" of my ring, I have done it every 4-6 days. The peroxide has never looked anything close to what it looked like the first time I did this. Now that I have my little secret, I am making sure to keep on top of it! I love how clean and shiny my ring looks all the time now! Ahhhhh. Doesn't life improvement feel good?? I'm currently soaking my ring hoping that it comes out nice a clean. I've enjoyed scrolling through your blog as I wait. You have a serious eye for decorating. Hey, thanks Emily! Great name BTW! 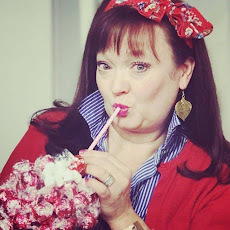 And thank you so much for your sweet comment about my decorating...I do love to decorate a little...haha. So, how did you ring turn out? Nice and clean? Yes it is shiny thanks! I'm not a very patient person so I only did it two times but my ring doesn't have nearly as many little holes as yours so it doesn't have as many places to hide the dirt. I'm super happy with my shiny ring results. Thanks for sharing the tip. I'll be checking back to drool over your decorating. I was surprised that I didn't get out much gunk but my ring has far less hiding places for it. I'll have to check the strawberry tip out. Hi there. I just read your post and wanted to see if hydrogen peroxide is safe on aquamarines? I have a white gold aquamarine ring with diamonds that shows up dirt quickly. It too has small holes that I can't reach in. Hello. I was hoping you could help me. 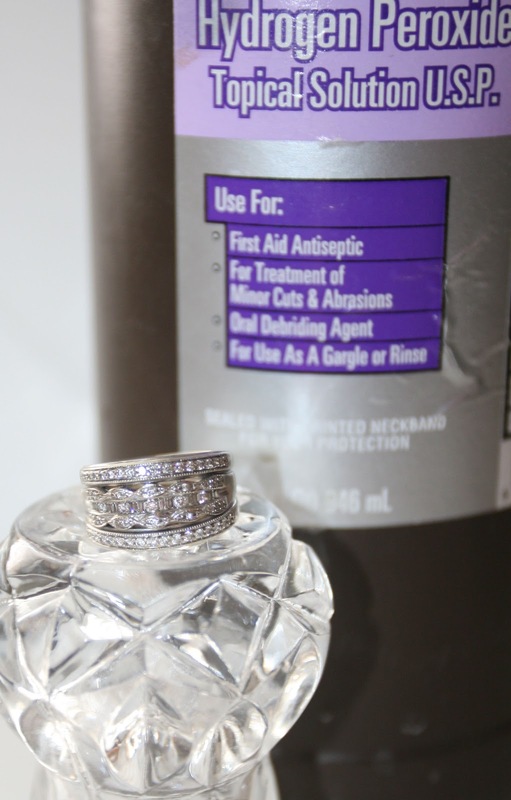 I would love to use hydrogen peroxide but wondering if it's safe on aquamarine rings? 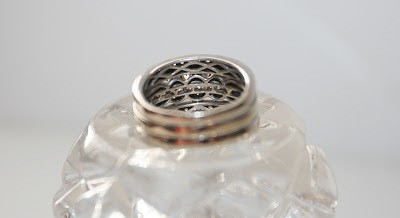 It's also white gold with diamonds and has small holes that are hard to clean. Thanks so much. Hi Jessica....I'm not a jeweler, so I can't answer that question for you! I'd try using just a little bit in some water instead of straight HP. I've done that with some of my other stones and they've been fine. But, as I stated in my disclaimer, I am not a jewelry professional, so do this technique at your own risk. The biggest things I would say to avoid are fake metals and pearls. Everything else that I have personally tried have been just fine! Wow! Cleaning my gold ring with just Hydrogen Peroxide for 20 minutes n it has only been less than 5 minutes n it's bubbling n cleaning itself... Just got a run 'um under hot water after... Yeaahhhhh! Saving me some breads... Ty sooo much for sharing this.. My ring is Fabulous again n here I was just about to spend $ on some store cleaner for my 1 ring. On my ring I have diamonds n a Amethyst... Both look sparkling. I can confirm that this should not be used on opals either. (same boat as pearls). Aquamarine should be ok, but I would suggest at least diluting the HP. I just did this with my wedding set, gold & diamonds. I haven't seen them this beautiful in so long! They were my husband's great grandmother's rings, they look brand New! Thanks for the tip! Works better than any store bought stuff! The gunk coming off my rings! Startling! I have used professional steam, ultrasonic, ammonia jewelry cleaner, recently heard about hot water and woolite (worked great- best it has in a long time, or so I thought! Lol), just did HP- OMG the funk coming off! This DIY solution rocks!! !